Veterinarians working to provide after-hours care are doing so on a voluntary basis. Please note that after-hour policies, prices, and services offered are unique to each hospital and may change without notice. On-call does not mean the clinic is open for business. If the veterinarian determines local care is appropriate, an appointment will be made for the veterinarian to meet with the owner and patient. All animals being seen for an emergency need to be properly restrained either on a leash or in a carrier. They may be carried by the owner only if they are too sick or debilitated to be restrained otherwise. On-call hours fall between 5:30pm-8am Monday – Saturday. Sunday on call hours fall between 8am – 8am (Monday), but when on-call is offered depends on the hospital doing on-call. Each hospital will provide you with a way to contact a member of veterinary staff. Many clinics are not offering any on-call after 9 or 10 at night due to many reasons including personal safety. The areas served by on-call are Clatsop and Pacific counties including Cathlamet. If you are a client who lives outside these borders, please use an emergency clinic in the Portland area and/or closer to your home. 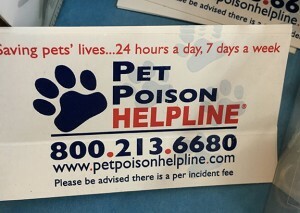 You may call us but it is up to the vet on call as to if they will see you and your pet. You are encouraged to locate a 24-hour emergency clinic in the Portland area to help in the event of an emergency. There are fees associated with on-call. Each clinic has their own pricing structure. Emergency care is more expensive than normal care. It is recommended that each pet owner have $1000-2500 set aside for emergency pet care. Be prepared to settle the bill at check out or leave a down payment based upon an estimate if the animal is admitted. Some clinics accept Care Credit. It is recommended to familiarize yourself with emergency clinics (in the Portland area) if the local veterinarian cannot be reached. The emergency clinic in the Portland area that AAH refers to is VCA Northwest Veterinary Specialists in Clackamas (503) 656-3999. Other clinics may refer to other emergency hospitals in the Portland area. If the on-call veterinarian doesn’t know your animal personally, an exam is required by Oregon State Law to legally answer any questions, provide service, or write prescriptions; therefore the on call service is not a question and answer line. If you are a keeper of exotic animals, it is STRONGLY recommended you find a veterinarian in the Portland/Vancouver area to help you in the event of an emergency. There is no on-call for exotics locally. Should you have an unexpected animal death, some clinics receive the dead animal out of hours; it is advised to call the clinic or on-call numbers to find out at that time. Astoria Animal Hospital provides cremation services.